Constructed June 2006 with approximately 2,100 square feet of centrally heated and cooled living area. The house features three bedrooms, two and-a-half baths, a fully equipped kitchen, dining room, laundry room and a large living area. The Master bedroom is located on the first floor and features a full bath that includes a shower, as well as a whirlpool tub, and a double vanity. The Master bedroom also features a huge king sleigh bed with a NASA memory foam mattress for the perfect night's rest. The two other bedrooms are located upstairs with a full combination bathtub/shower and double vanity. Each floor has a separate thermostat to control the temperature. 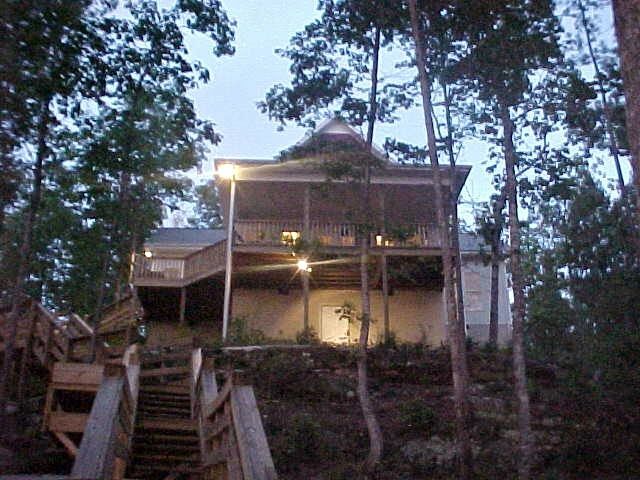 The den/living area is approximately 24' by 16' with glass windows across the back for a breathtaking view of Smith Lake. There is ample seating as well as a 50' flat screen television. There are three restaurants, two grocery stores, and a coffee shop within eight to ten minutes. The deck is located on the back of the house and has a covered area as well as an uncovered area that overlooks the lake. A table and chairs are provided for outdoor dining. In addition,there is a two tier deck on the bluff overlooking the lake below the lake house that has built in bench seating. Wow - we were so pleased with this property! This was exactly as we had hoped it would be.. peaceful and cozy. Family needed a short getaway from the stress of work and school and this did the trick. We spent a lot of our time on the deck down by the lake... it was just beautiful. And the stars at night can't be beat. We have already discussed coming back again. So happy your enjoyed your stay at Houston’s Hideway!! Thank you for staying with us and please consider us again whenever you need another getaway!! This was my 3rd stay in this lovely home, and it was great! The home was spotless, and is well equipped. The views from the back porch were so relaxing with our morning coffee. It is conveniently located near Arley for grocery shopping, and there are a few restaurants nearby. Chef Troy's can't be beat! Thank you so much for staying at Houston’s Hideaway and we’re glad you had another enjoyable stay!!! Please come back any time!!! 3 great Bedrooms. Lovely layout so can cook and relax together. Awesome views. Only recommendations are to maybe get a Kettle for the Kitchen and we did struggle with enough hot water to fill the Bath Tub but maybe that’s just a setting issue. Awesome place and despite cold and windy weather we were warm and felt secure and very very happy. Owners very responsive to emailed questions. We will be back one day hopefully! This house is beautiful and it is so peaceful here! We are so glad you enjoyed your stay and hope you will stay with us again in the future!! What a beautiful home, and beautiful setting over looking the lake. We loved our stay. We were here for Christmas from Canada and totally enjoyed the experience. Highly recommend staying here! It was peaceful and we enjoyed taking walks around the area. We all took advantage of the stairs down to the dock; great workout...wish we had those back home! Thank you for sharing your hideaway! So glad y’all enjoyed your stay!! I think y’all get the award for the longest distance travelled!! Please come back when you’re down this way again!! We enjoyed this quiet and relaxing home with a view of the lake. The walk down to the dock and back provided much needed exercise and fresh air during our wintry stay. The house is well-appointed and conducive to group meals, including grilling, and game nights, as well as privacy when desired. We couldn’t find the vacuum cleaner mentioned, and the house could use more coasters, but we would definitely come back! We never get tired of hearing our guests enjoyed their stay!! Please come back and visit us again real soon!! We appreciate your input and will take necessary steps to remedy those issues.